I have written the following articles few weeks back. 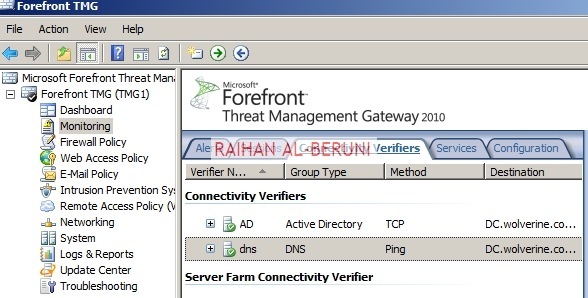 One thing I would like to add on to these articles is the patching order of Forefront UAG 2010. 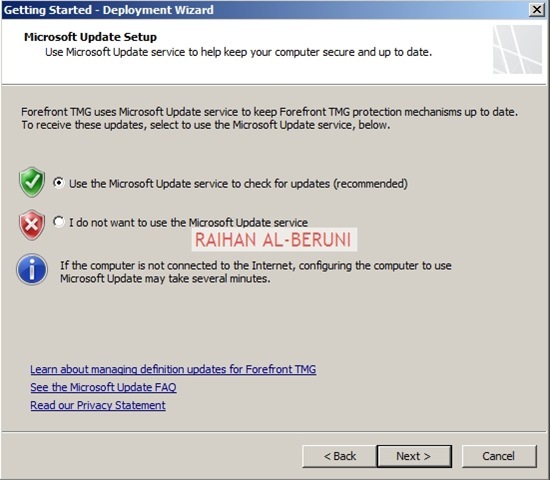 You must have a base build Windows Server 2008 R2 SP1 with all Microsoft security and critical updates. 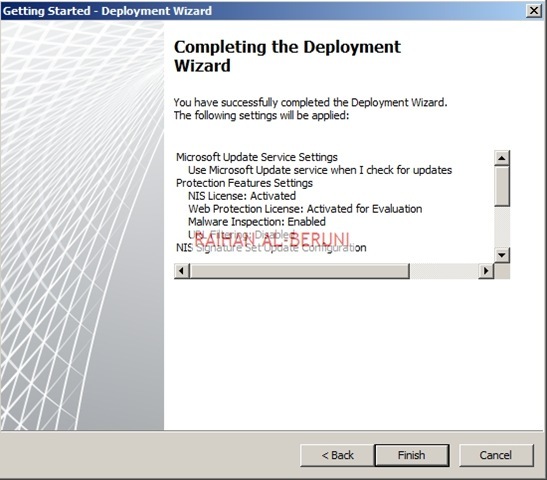 you install the UAG from the this source Forefront_UAG_Server_2010_64Bit_English_w_SP1 with correct product key from Microsoft volume licensing center. The following the order of patching UAG before you start configuring UAG. you can add multiple internal network ranges such as 10.10.11.1/24 and 10.10.12.1/24 in TMG but assigned internal NIC of TMG server will be just one. In this situation, you have to create vlans, IP routing and access rule in the core switch or layer 3 switch. You can add multiple perimeter networks also in your infrastructure. In this scenario, you have to assign specific NIC for specific perimeter network. You may visit specific server manufacturer web site to find out maximum number of supported NIC in a server hardware and Microsoft website to see supported maximum number of NICs in a physical and virtualized windows server. 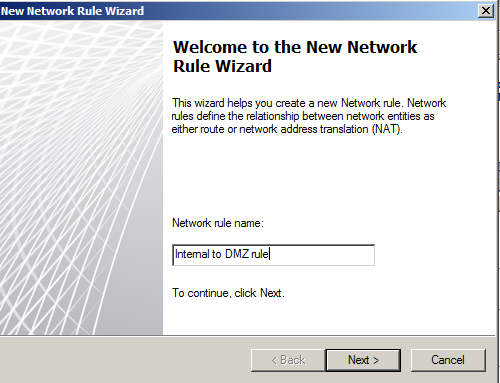 In real life DMZ and External network must have public IP addresses i.e. routable IP addresses. In a perimeter, you can publish Exchange CAS, OCS and Sharepoint Frontend server or choice of your web server. The following Visio diagram depict a typical 3-leg perimeter or DMZ. Install Windows server 2008 in a virtual or physical machine with recommended systems requirement. insert TMG DVD or mount TMG iso on virtual server. 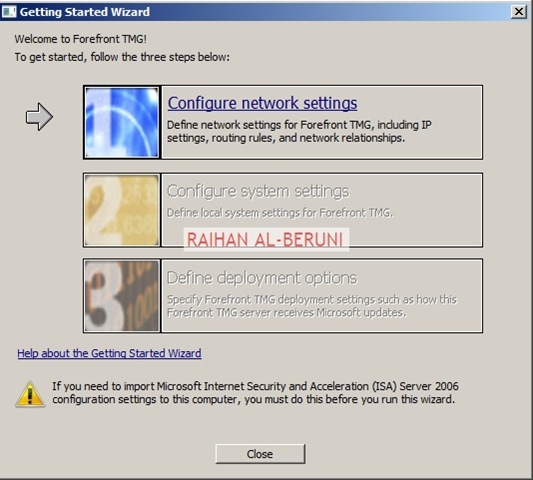 Run TMG preparation tools and Run Installation wizard. Follow my previous step by step TMG installation guide to install TMG. It would redundant to write again. 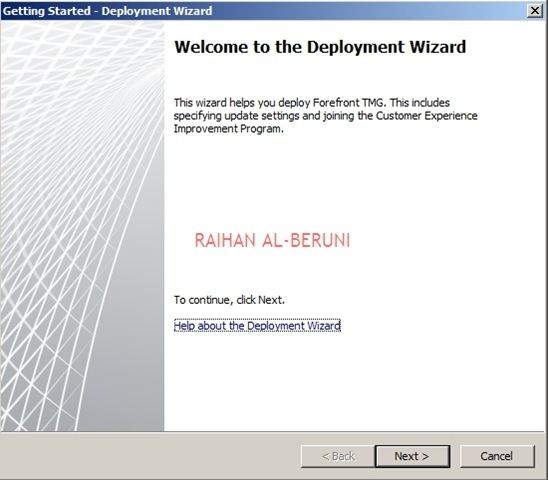 Open Forefront TMG Console>Select TMG Array>Launch Getting Started wizard from Task Pan. You will be presented with configuration wizard. 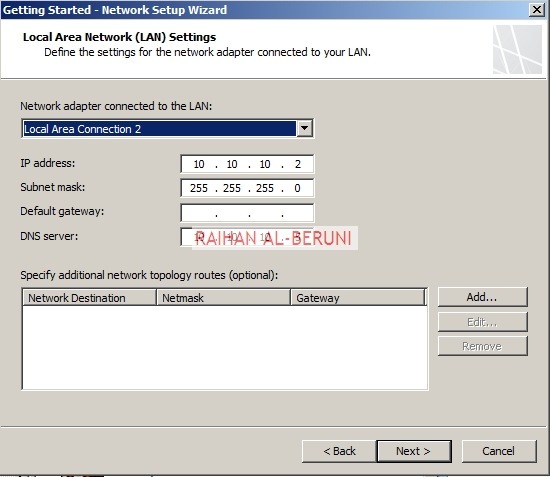 Click Configure network settings>Click Next> Select 3-Leg Perimeter>Click Next. 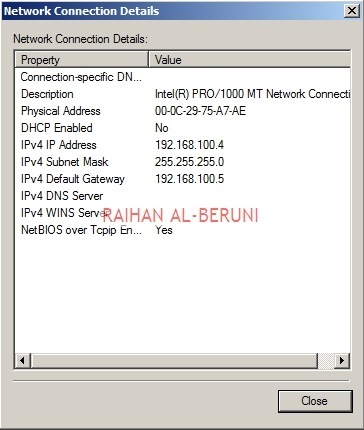 Select internal, external and perimeter network on the following three steps. Remember, you must configure static IP for all NICs. 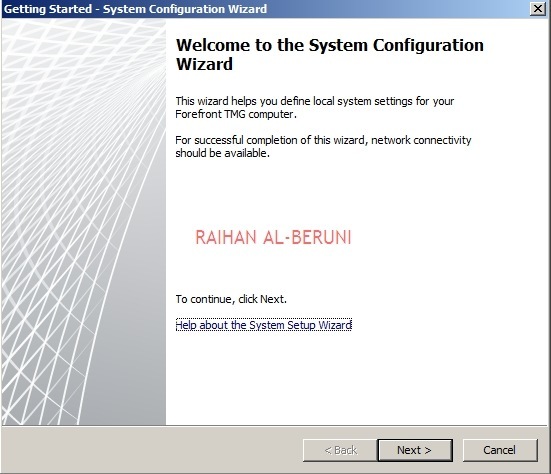 Now configure system settings and define deployment options on the next steps. Click on networking option>verify all the settings by visiting property of internal and perimeter networks. 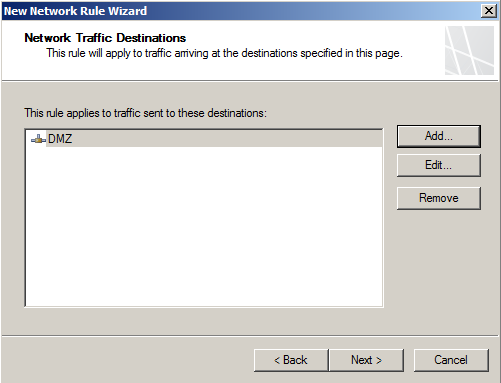 You may add desired routing rules in the network rules. To allow LDAP authentication in perimeter network, right click on firewall policy>Click new>Click Access policy. On the selected protocol, Add DNS, Kerberos-Admin (TCP), Kerberos-Admin (UDP), LDAP, LDAP(UDP), LDAP (GC), Kerberos-Sec (TCP), Kerberos-Sec (UDP), Microsoft CIFS (TCP), Microsoft CIFS (UDP), NTP, PING, RPC (All Interface). On the source, specify particular web server (or server) and on the destination specify AD DNS server. For this article, I am adding perimeter and internal network as a whole . However, in production environment I would not recommend to do so. For security season, by default everything is blocked in TMG server. you have to add protocols and rules one by one. Create specific rule for specific purpose. Apply changes>Click ok. 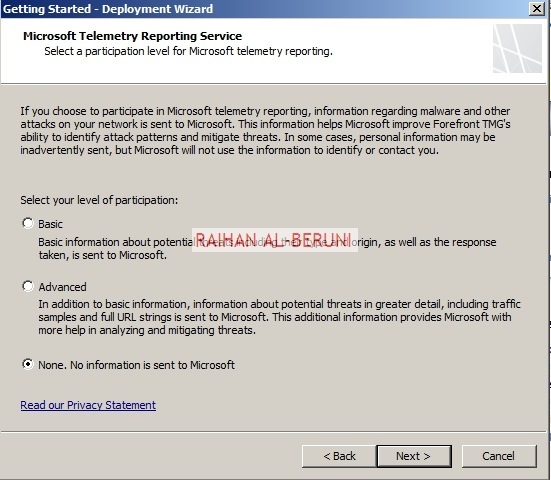 Right Click on the rule>Click property>verify all protocols, source and destination. To publish any web server in the perimeter, follow the link provided in the relevant articles. To publish secure web sites, import web server certificates in TMG server and web server and follow the web publishing rule. Placing a firewall in a corporate network puts you in commanding position to protect your organisation’s interest from intruder. Firewall also helps you to publish contents or share infrastructure or share data securely with eternal entity such as roaming client, business partners and suppliers. Simply, you can share internal contents without compromise security. 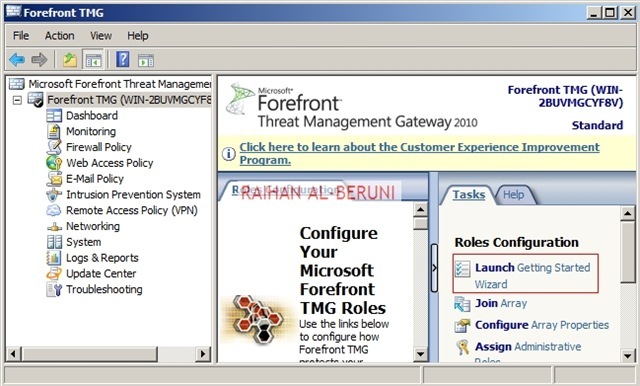 For example, publishing Exchange Client Access Server, OCS 2007 and SharePoint front-end server in the perimeter. In this article, I am going to illustrate Back-to-Back Firewall with DMZ. This topology adds content publishing to the back-to-back perimeter topology. By adding content publishing, sites and content that are developed inside the corporate network can be published to the server farm that is located in the perimeter network. 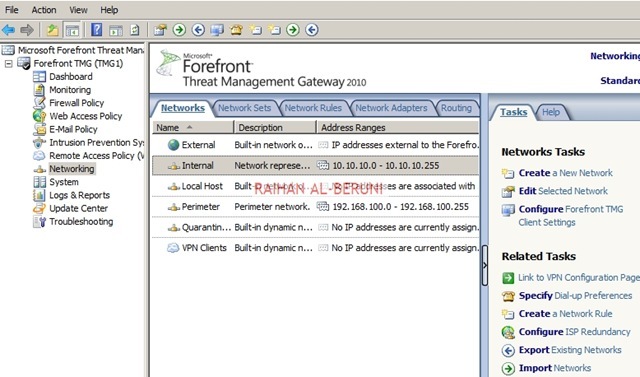 Isolates customer-facing and partner-facing content to a separate perimeter network. Content publishing can be automated. If content in the perimeter network is compromised or corrupted as a result of Internet access, the integrity of the content in the corporate network is retained. Requires more hardware to maintain two separate farms. Data overhead is greater. Content is maintained and coordinated in two different farms and networks. Changes to content in the perimeter network are not reflected in the corporate network. Consequently, content publishing to the perimeter domain is not a workable choice for extranet sites that are collaborative. Note: In the production environment, perimeter IP must be public IP accessible from internet. Persistent Routing in Front-End TMG and all servers placed in perimeter/DMZ: You must add following routing table in front-end TMG server and all other servers placed in perimeter in elevated command prompt. To do that, just log on as administrator, open command prompt and type following and hit enter. Log on to TMG Server using Administrative credentials and define internal IP as shown on TCP/IP property. Now add TMG server as a domain member. 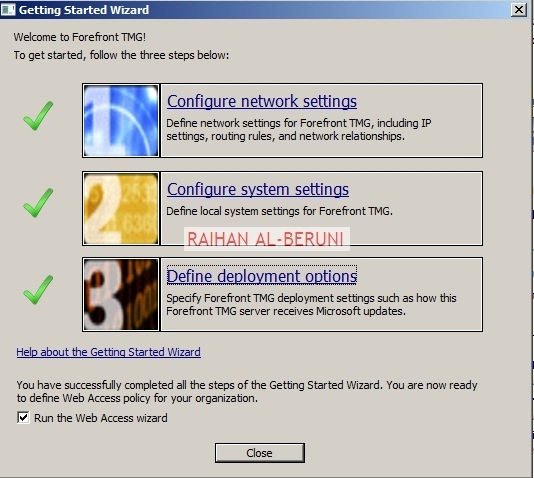 Install Forefront TMG using Step by Step Guide Lines. Open TMG Management console, Launch Getting started Wizard. 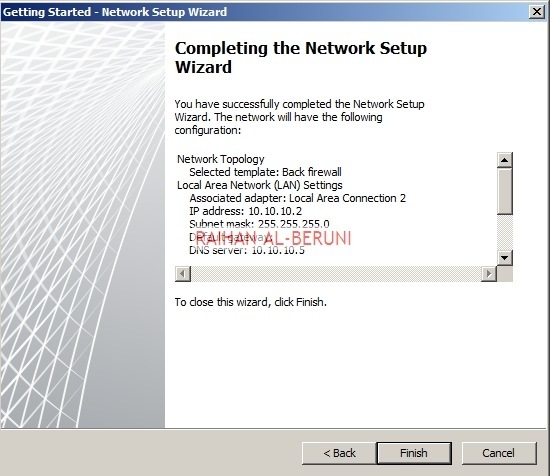 Configure network Settings. Select back Firewall. Click Close. Apply Changes and Click Ok. Create connectivity with AD and DNS. 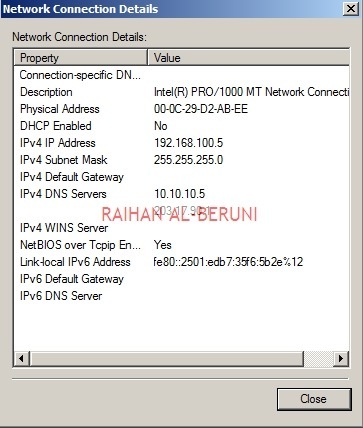 Add and Verify IP addresses of internal (10.10.10.0/24) and perimeter network (192.168.100.0/24). Create Network Rule. 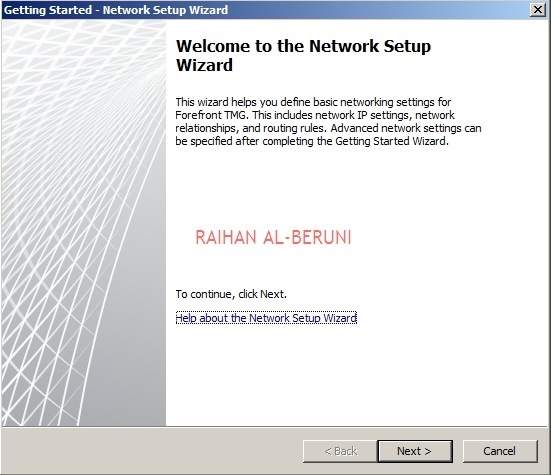 To do that click on Networking>Network Rules>Create a New Network Rule Wizard. 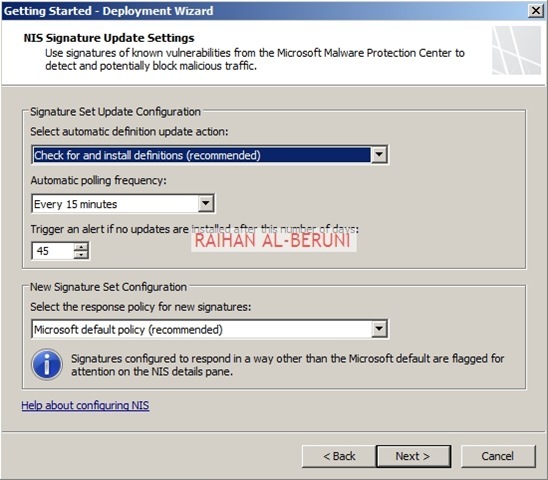 Here, Rules 1 to 4 will created by default while initial configuration as shown below. You have to create rule 5 and 6 by repeating above steps. Now Publish DNS for perimeter network. 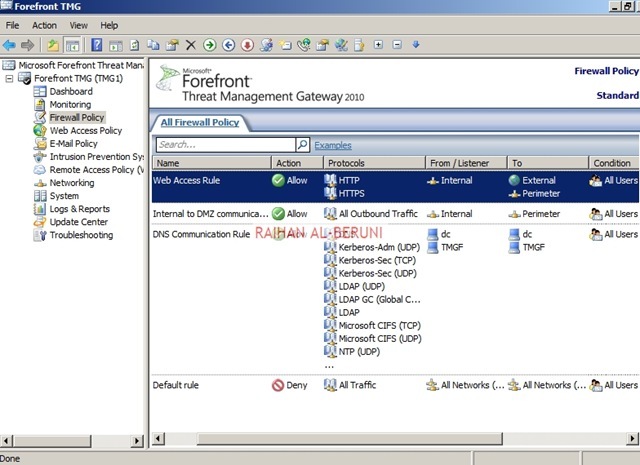 Right Click on Firewall Policy, Click New, Click Access Policy, Name new access policy. On the selected protocol add DNS, Kerberos-Sec(TCP), Kerberos-Sec (UDP),Kerberos-Admin (UDP), LDAP, LDAP (UDP), LDAP (Global catalog), Microsoft CIFS (TCP) ,Microsoft CIFS (UDP), NTP (UDP), PING, RPC (All Interface), Click next. 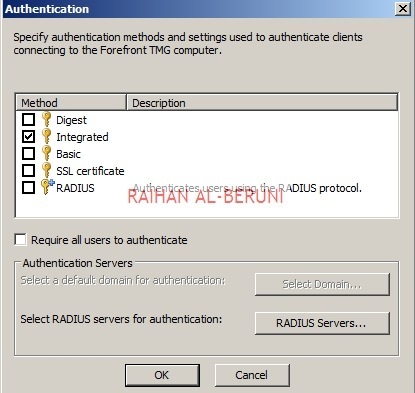 On the Access Rules Sources, Click Add, Select Computers, Click New, Type Netbios name of DC and Type IP, Click Ok. Select DC and Click Add. 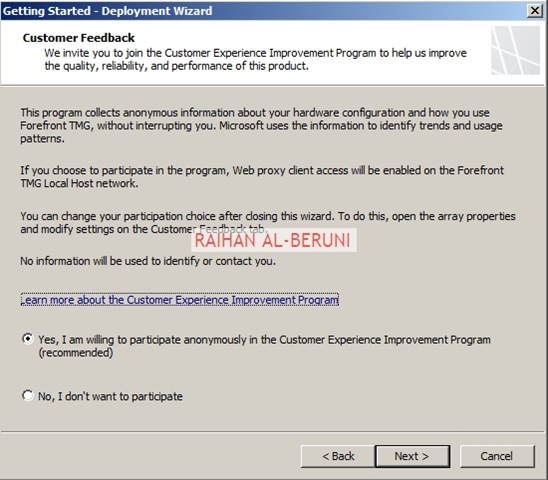 Repeat this process for Front-End TMG server i.e. 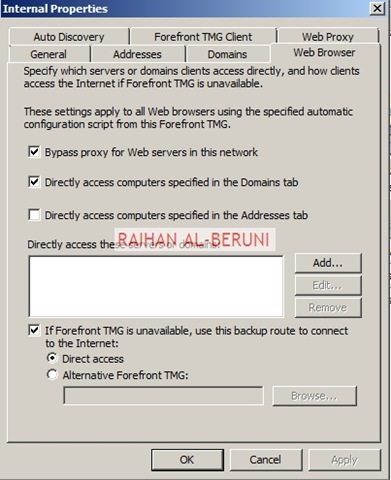 add name and IP of front-end TMG server and Click Add. 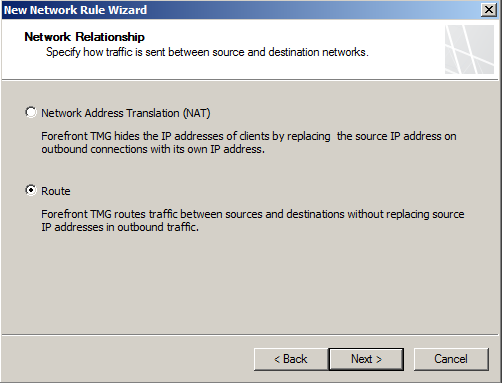 On the Access Rule Destinations, Click Add, from the computers list add DC and front-End TMG servers. Click Next and Click Finish. Apply changes and click ok. Create an Access Rule allowing all outbound traffic to go from internal to perimeter. Create another access rule allowing HTTP and HTTPS to go from internal to perimeter and external. Prepare another Windows Server 2008 x64 computer. Log on as an administrator. Define internal and external IP addresses as shown below. 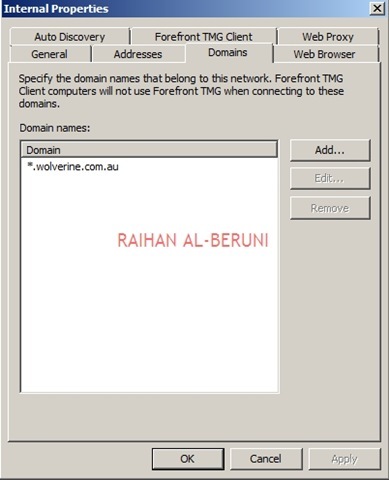 Add Front-End TMG as domain member. 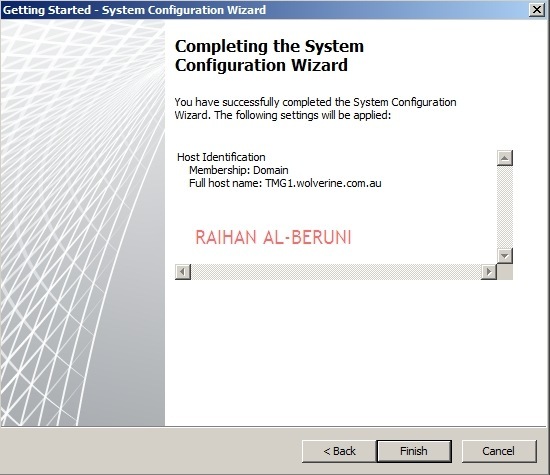 Follow same installation and initial configuration options shown in back-end TMG server. 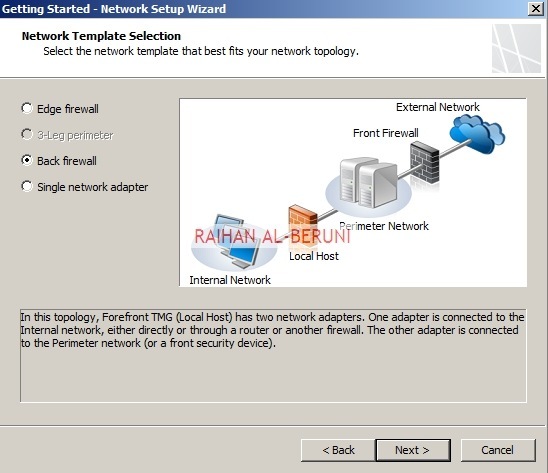 There are only two differences while initial Network Settings configuration that are selecting internal (192.168.100.0/24) and external (203.17.x.x/24) network. Those are shown below. Create Connectivity Verifier with AD, DNS and Web. 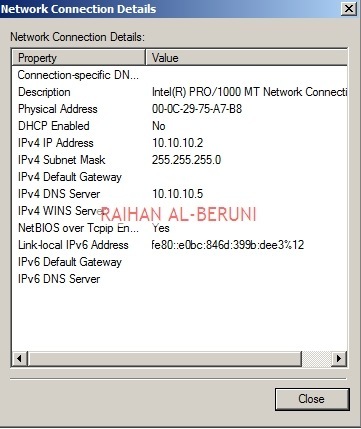 Networking>networks>internal>Add 10.10.10.0/24 and 192.168.100.0/24 as internal IP. Make sure internal IP and perimeter IP of back-end server are both internal IP of Front-end server. keep default routing rules in Front-End TMG. 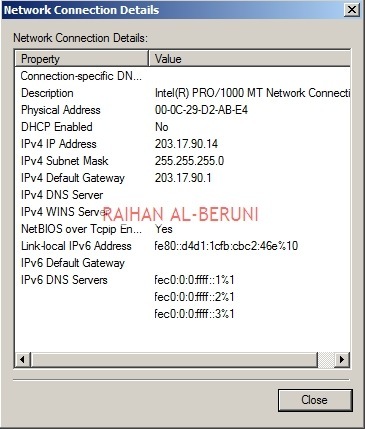 Configure property of internal network. Configure firewall to allow HTTP/HTTPS : Firewall Policy>New>Access policy>Allow HTTP and HTTPS for all users. Do not Allow all outbound traffic to go from internal to external in Front-End Server. Only specific ports and protocols should be allowed. Test Firewall: Log on to a computer in internal network behind Back-End Firewall. 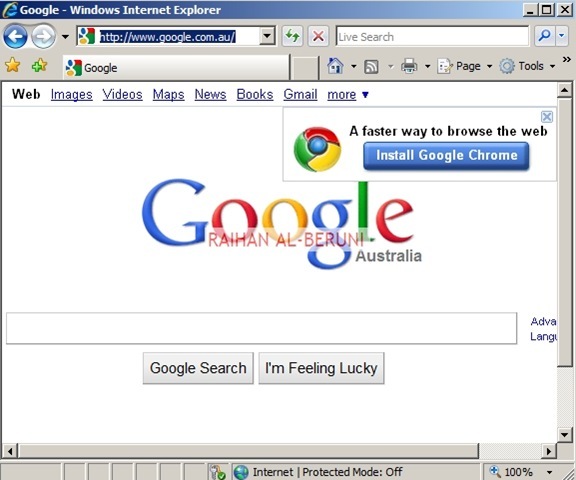 Setup Proxy in IE as shown below and browse internet. One you have completed above steps, you are ready to place any Front-End server(s) such as Exchange CAS, OCS 2007 and SharePoint Servers in DMZ/Perimeter. You need to import certificates from Enterprise Root CA placed in internal network (behind Back-End TMG) to Front-End TMG server to publish secure web sites such as OWA, Outlook Anywhere or OCS. All Publishing Rules Applied in Front-End TMG server. Here, I am not writing OWA or Anywhere because it would redundant for me to write again as I have shown all these in my previous posting. Visit the links mentioned below. Prerequisite for placing a member server in DMZ: A member server must have following TCP/IP configuration to work in perimeter.